Masahiro Motoki plays our straight-man Wada, an overworked salary man sent over to inspect some jade mines. He spends the first half the movie being exasperated by the antics of his companions, especially Ujiie. Still, the two form what could be called a friendship by the end, and Motoki does a good job and keeping a straight face while his friends muck about. His arc, like Ujiie’s, picks up once they arrive at the village. Wada becomes fascinated by their culture, having little contact with the outside world or its technology, and sets about trying to gather as much information about them as he can, forgoing his original mission. As the film shifts focus, Wada becomes a moderating figure, seeking to calm Ujiie’s diminishing sanity and bring his friend back from the brink. He is also instrumental in the finale of the film, which forges a bold path between progress and preservation when it comes to modernization. Ujiie (Renji Ishibashi) on the other hand, opens up the film as an oafish buffoon, who is quick to anger and quick to violence. Most of his abuse towards his compatriots is played for laughs, containing all the hallmarks of slapstick: exaggerated sound effects, reactions, and little permanent damage. Still, Miike’s influence can still be felt, as some of his assaults veer too close to actual beatings, which robs some scenes of their comedic impact, and occasionally made me a tad uncomfortable. It appears Miike might have had some trouble toning down his violence to a more light-hearted degree, though the choice pays off later in the film. Once the group arrives, Ujiie becomes enamored with the villagers and their life. He becomes the representative for the well-intention ed who wish to preserve a culture by denying it contact with the outside world. He acts as a criticism of these people as he slowly resorts to more violent and destructive measure to “protect” the village. I won’t spoil how his arc ends, but it’s an interesting situation with an ending that’s actually quite surprising. But all this belabors the biggest problem (yet it’s most critical component) the film, and that’s the shift in tone between its two halves. The first half is just a road-trip comedy. Antics are had and hi-jinks ensue while seeing the beautiful Chinese countryside. It’s charming and silly and lighthearted. Then they get to the village. The movie becomes a much more serious film, focusing on the dilemma of what to do with the village, as the protagonists grow to care for it and must decide how to balance their need to do their job and protect what they feel is an important culture. It was a little jarring for me personally, but that could just be a personal issue. However, this clash is absolutely necessary, as the finale hinges upon Ujiie and Wada’s relationship, which needed the road-trip portion to occur to be believable. It’s an interesting dichotomy. I acknowledge that it was a necessary choice for the point Miike wanted to make in the end, I just feel that it maybe could have been handled better. I would also be remiss to mention the scenery. This film takes place in some stunning locations, and the road-trip portion acts as a wonderful commercial for China Tours. The film truly emphasizes the natural aesthetics of the region, as the trio moves further away from the urban sprawl and nature begins to reclaim more of the area. This helps reinforce the theme of preservation vs. progress, clearly illustrating the natural impact of modernization and the way it affects the environment. The editing aids this effect. Yasushi Shimamura (Editor) and Miike deserve credit for further underlining the differences between the modernized Japan and the traditional China. The film utilizes quick edits and up close shots in the bustling Japan, but shots become longer and less choppy the farther they get, culminating in some stunning sweeping shots of the Yunnan province that capture the immensity of what Ujiie and Wada are trying to protect. Overall The Bird People in China is a solid film that takes Miike out of his usual comfort zone and manages to make a compelling argument for a middle ground between preservation and progress, as well as being a visual treat at times. Barring the strange tonal shift, it’s an enjoyable film and nice addition Miike’s library. Garnering various accolades for being a standout in the genre romantic comedy, My Sassy Girl entreats the audience to the comical story about the goofy play-boy wannabe named Kyun-woo and his erratic, tumultuous relationship with his tough-skinned, aggressive girlfriend, who is referred to as The Girl. Released in 2001 in South Korea, My Sassy Girl originated from a series of online blog posts detailing the romance of a couple who met in unexpected circumstances in the metro station in South Korea. Directed by Kwak Jae-yong, the film is known for the combined acting of its celebrity actor and actress Cha Tae-hyun and Jun Ji-hyun who play Kyun-woo and The Girl, respectively. Having much international success, especially in countries in East Asia, the movie boosted their careers and inspired remakes of the film in several other countries: U.S., Japan, India, and China. Given the dual nature of romantic comedy as a hybrid genre, the audience can expect to see an eclectic mix of different themes playing together. Being in a relationship with the stubborn Girl, Kyun-woo constantly finds himself in situations in which The Girl subverts gender roles and putting him in embarrassing situations. While constantly ending up in comically ridiculous situations, Kyun-woo continuously perseveres in his role as The Girl’s boyfriend, jumping through hoops for her to be happy. In one instance, The Girl subverts the gender roles by guilt-tripping Kyun-woo into wearing her high heels while she wears his sneakers, emasculating him as he chases The Girl past groups of students and through an ongoing baseball game at his own university. Throughout the film, he comically ends up in prison surrounded by gangsters several times and as a hostage of a renegade soldier of the South Korean army. In each situation, he depends on the movie’s heroine The Girl to rescue him. Besides exploring subverted gender roles, the movie dabbles with the theme of fantasy and time. In various scenes, The Girl and Kyun-woo will adopt the heroine and the secondary acting roles, respectively, in the various screenwrites created by The Girl. While some of these fantasy stories may take place in a sci-fi world or an ancient Korean peninsula, the heroine’s character is always from the future, evoking the theme of time. Time becomes associated with transformation for the sake of growth as the movie progresses as exemplified by Kyun-woo. While he struggles and perseveres in being the boyfriend that The Girl needs by playing a secondary role to the film’s heroine, Kyun-woo shows his best qualities through his desire to compliment The Girl’s personality while improving himself throughout the story’s progression. These key moments when Kyun-woo takes the spotlight show the romantic side of the film–as the camera captures a continuous shot of his monologue, we see significant growth in him as a character through how he becomes sensitive to The Girl, making her a priority and a responsibility. After seeing My Sassy Girl, the audience will enjoy a unique viewing experience–one that inspired similar films that cannot compare to the original. Through the various themes expressed in role reversals and romantic moments, the audience will enjoy this hybrid drama in which they will share the happy and sad moments in the characters’ lives while laughing at the same time. Infernal Affairs (2002) risks losing its audience in its story almost as much as the main characters risk losing themselves in what they do. From directors Andy Lau and Alan Mak comes a film about identity and acting. And of course, a film about acting puts heavy reliance on its actors. Luckily for Infernal Affairs, this trust is well-placed, as the actors definitely carry the film. Audiences seemed to agree that it was a success, as the film has received critical acclaim not only in Hong-Kong, where it was made, but also internationally. Infernal Affairs is the story of two men: one who is a deeply undercover cop working under a gang leader and one who is the exact opposite—a man who is a mole for the same gang, working in the police force. They are both given the same task: they are to find the traitor in their ranks and deal with him. Whoever finds the other first, will undoubtedly win, and as the film itself notes, whoever loses, dies. From here on out begins a tale of espionage, centering on these two characters. The film starts at fast pace and continues to build, with violence always looming overhead. In a tale of false identities, it is critical that the actors do their job as well as they do. Tony Leung, known for Hero and In the Mood for Love, plays the part of Yan, the undercover cop. Andy Lau (separate from the director, Andrew Lau), known for House of Flying Daggers and The Warlords, plays the part of the gang mole, Ming Lau. Their actual dialogue tends to show very little of what they actually think, as most of it is in their roles. For example, toward the start of the film, we see the police trying to bust the gang for drugs. Both of the main characters are working for their respective sides and neither is in a position for much dialogue. And yet, this is one of the more telling scenes, as they show who they’ve become as adults outside of training. Almost no words are exchanged during this scene. However, it is precisely through their non-verbal acting and careful words that we see who they are. Though we know who they supposedly are at the start of the film, the question of identity remains throughout the film, and if you think you’ve got these characters figured out, then you had better finish the film. While Infernal Affairs does deal with gangs and police forces and has a lot of violence, it takes much more after a film like Goodfellas, rather than The Godfather. A danger of many films in the gangster genre is the idea of glorifying this underworld, which Infernal Affairs does a good job of avoiding. Instead of working within the underworld and making some of them seem like heroes, Infernal Affairs shows the kind of ambiguity that we see in Goodfellas, where the world is incredibly harsh, yet far from black and white. Henry Hill and Jimmy Conways’ characters from Goodfellas are much closer to those in Infernal Affairs than those of Michael and Sonny Corleone in The Godfather. Yet Infernal Affairs never takes the perspective of a character like Henry Hill’s in Goodfellas. And as there is no inner monologue, our access to these characters is done purely through how the actors themselves show these characters on camera. Of course, the actors alone do not make the film. A good actor will never reach his or her full potential without good direction. In the case of Infernal Affairs, there are two directors: Andrew Lau and Alan Mak, both of whom are now known for the Infernal Affairs movies in particular. However, Andrew Lau has done extensive work as a cinematographer and photographer, and Alan Mak was a relatively new director at the time, who also has received credits on the Academy Award-Winning adaptation of Infernal Affairs, The Departed. Their combined efforts yielded a strongly directed and beautifully shot film. All in all, Infernal Affairs is a film about identity, who you are and who you choose to be. It takes the form a fast paced gang-thriller, but to stereotype it by genre would be to judge a book by its cover, which would be a grave mistake here. The acting and character development brings this film to life, engaging the audience in a very relatable way. “Goodfellas” Internet Movie Database, 2014. 8 April 2014. “The Godfather” Internet Movie Database, 2014. 8 April 2014. “Infernal Affairs” Internet Movie Database, 2014. 8 April 2014. Infernal Affairs. Dir. Andrew Lau and Alan Mak. Perf. Andy Lau, Tony Chiu Wai Leung, Anthony Wong, Chau-Sang. Media Asia Films. 2002. Film. 3-Iron, directed by Kim Ki-duk, has won many prestigious awards including the Little Golden Lion award at the 2004 Venice International Film Festival and the Golden Spike Award at the Valladolid Film Festival in 2004. The uniqueness and allure of the film comes from the glaring lack of conversation that almost always exists between the characters. Through silence, the film discusses the importance of facial expressions to convey an idea or a sentiment, how the display of emotions, especially tenderness and love, can be conveyed more poignantly than if the emotions were verbalized, and how the absence of sound can more starkly contrast different people’s lifestyles. The film focuses around the journey of a lost soul named Tae-suk, played by actor “Hyun-kyoon Lee”, and an abused wife who runs away with Tae-suk, named Sun-Hwa, played by actress “Seung-yeon Lee”, as they quietly live in other people’s homes. They are squatters, people who slip in and out of the house and leave no trace as if they were never there. They do not steal from the owners and what they touch they put back or even fix, if it was broken. Many movies have an abused wife, like Fried Green Tomatoes or Punch Lady, but the fact that she becomes a squatter with a younger man is something new and refreshing. This bizarre twist is one of the many hooks for the film. The movie is filled with unspoken emotions, as these emotions are explored instead through silence. This would seem rather hard to do, but with his innate skill, Kim Ki-duk pushed his actors to express their actions through facial expressions, or lack thereof, and deliberate actions. Tae-suk’s signature smile is probably one of the best aspects of the movie. It held so much emotion and displayed so much of the character’s personality. The smile is used in many scenes throughout the entire film, but in each scene it takes on a different meaning. The smile shows compassion towards Sun-hwa and is also used to taunt the police who are trying to get information out of Tae-suk. Hyun-kyoon Lee is able to perfect Tae-suk’s smile so that it almost seems to speak for Tae-suk. Kim Ki-duk shows that love and solace can be found in the gentlest touches and does need words to validate it. This can be seen in the fact that the love between the protagonists is the strongest emotion displayed in the film. In one particular scene, we see Tae-suk lay his head in the crook of Sun-hwa’s neck and she strokes his head as his tears fall. The love between them shines comfortingly and honestly. No words are spoken, but a shoulder to cry on and the reassuring pressure on his head is enough to express her feelings for him and show that she is by his side. The silence of the Tae-suk and Sun-hwa contrasts starkly with the talkative families that inhabit the houses where the protagonists stay. The talking between the family members is nothing out of the ordinary, it merely shows conventional familiar relationships from sweet talking to fighting. However, it does further separate the two main characters from the everyday reality that the talking people represent. It creates the feeling that the protagonists are on a different plane of reality from the other characters, because it feels like they are looking in on the normal lives, not living them. The protagonists just lurk in the corners of normalcy trying to feed off of the people by occupying their houses, but in the end they never truly assimilate. But, together they are able to make their own life system, even though it is nothing like the other families, it makes them happy. Going from house to house, sleeping and eating together, not talking but affectionately touching each other, and taking pictures in others’ homes is what makes them satisfied even if they differ from the ‘normal’ families in whose houses they stay. This is a contrast, but their life style is not necessarily a bad thing because they seem to enjoy it, as long as they have each other. Kim Ki-duk seems to be neither condoning nor condemning silence. He shows what the absence of sound can reveal. It can tell everything from how people truly feel about each other to what it can reveal about different life styles. Kim Ki-duk has his main characters embrace silence as a medium to portray the protagonists’ story of their life together. Seven Samurai (1954), a film by legendary Japanese director Akira Kurosawa, is widely regarded as one of the most influential and powerful films of its time—and perhaps there this some truth in this view. This film was made earlier on in Kurosawa’s career and helped him, along with a few of his actors, on their rise to international recognition. Driving this film in particular is its cinematography, showing themes through subtle detail, such as focus. What kind of film is Seven Samurai? To call it merely an action movie would not do it justice, since though the plot of the film revolves around the impending action, the majority of the movie is not contained in the relatively short action sequences. The movie plays out much more like a drama, centering itself around the three main characters: Katsushiro (Isao Kimura), a young, aspiring samurai, Kambei (Takeshi Shimura), an old and wizened samurai, and Kikuchiyo (Toshirô Mifune), a samurai of questionable legitimacy. The actors in this film help to carry it through, with particularly strong performances from Mifune and Shimura, both of whom are known for their work in collaboration with earlier Kurosawa films, such as Drunken Angel (1948), Stray Dog (1949), and Scandal (1950). The synergy between Mifune and Shimura helps to keeps the two characters dynamic and engaging throughout the three-and-a-half-hour film. Kurosawa makes no mistake in keeping them in-focus, both literally and metaphorically. Though not every scene focuses on them, and in fact, characters like Katsushiro receive a fairly large amount of screen time, Kurosawa shows their well-developed and influential characters through his camerawork whenever they are around, giving the actors the chance to show what they are capable of. Of course, there is only so much to be said for characters in a vacuum. The film’s basic plot involves a small village, which discovers that bandits plan to attack them in a few short months. Instead of fighting by themselves or surrendering their crops to the bandits (which would mean starvation), they come up with the plan to hire some samurai to help them defend their village. They go to a nearby village and manage to convince an older samurai, Kambei, to help them, even though the villagers cannot pay more than to feed the samurai during their stay. Kambei manages to pull together a rag-tag group of samurai to ward off the bandits. As I previously mentioned, the film doesn’t concentrate on the bandit attack that acts as a catalyst for the villagers and samurai, but rather on the characters themselves. Kurosawa weaves philosophy seamlessly into the film, making it feel natural while still holding the powerful and thought-provoking effect it is capable of. Though the bandit attack certainly moves the plot along, it ends up being more a device to tell a tale of these samurai, the farmers, and how we act under pressure, rather than being a tale about a bandit attack. The film deals with themes spanning from duty and obligation to identity and classism. The film is very long, running 207 minutes, but nothing feels out of place or unnecessary. Every scene is needed in its own way, with many shots telling a story beyond the dialogue or action in them. As Kurosawa is known for, his use of focus helps tell the story, which we can see throughout the film. In simple conversations, such as between the samurai and the village elder, the use of focus highlights who has power and who is important to the conversation. Whereas most directors keep only one part of the shot in-focus, Kurosawa will keep several different things in the shot, perhaps actors, perhaps props, in-focus, which also highlights the fact that much of the shot isn’t in-focus. Kurosawa’s mechanical ability in filmmaking contributes to this film’s critical acclaim and international success. Kurosawa’s samurai film strays away from the genre of action movie, and moves more towards the genre of drama. Through his masterful cinematography and storytelling methods, he weaves a complex tale with very simple origins: how we should and do react under duress. Kurosawa’s philosophy is told here in a powerful way, and every element of the film contributes to it, especially the cinematography. Anyone can understand what happens on the surface, but to truly grasp the film requires a more careful look. Seven Samurai. Dir. Akira Kurosawa. Perf. Toshirô Mifune, Takashi Shimura, Keiko Tsushima. Toho Company. 1954. Film. “Seven Samurai” Internet Movie Database, 2014. 7 Mar 2014. Shichinin no Samurai, or Seven Samurai, is a film directed by the late Akira Kurosawa. He gained initial fame with “Rashomon,” which won the Golden Lion award at Venice in 1951 and brought him international acclaim. The film is action based, character driven with well-developed individuals, and shows the struggles of two opposite groups working to fight together for a common cause. The film itself was made nine years after WWII and three years after the end of US occupation of Japan. During the US occupation, films like Seven Samurai were banned due to themes of feudal culture and militarism. However, this film was a huge international and domestic success. The film spent well over budget as Akira Kurosawa preferred to focus on perfecting the film first and then the budget. Because the film was so long, he was able to take the time to fully develop his characters. The film has many main characters which Akira Kurosawa meticulously describes and never over-simplifies. This is exemplified as each character is introduced to the audience one by one, and through their various introductions we see their personalities, further developed, refined, and expanded on throughout the rest of the film. The movie begins with a group of bandits about to raid a small farming village that is on the verge of starvation. This prepares the audience for a vast range of emotions that are sure to follow such a striking setting. With the blessing of the village elder, three farmers go to a neighboring village to try to hire samurai to help protect their village. They meet Kambei, who becomes the leader against the bandits. He tricks a kidnapper to save the life of a young child and through this act, the audience sees that Kambei is smart and able man who is very resourceful. Kambei then recruits young and naïve Katsushirō, an old comrade called Shichirōji, two skilled and friendly fighters named Gorobei and Heihachi, and perfection-driven Kyūzō. Lastly there is Kikuchiyo, who is not a samurai, but relentlessly follows the rag tag group to the village and eventually is allowed into the group due to his resilience and reckless charm. Throughout the movie Kikuchiyo plays the role of a bridge as he connects the samurai to the farmers, as his father was a farmer. He often soothes the irritation that arises from the contradicting value and goals of the samurai and farmers. A bond is formed between the lethal samurai and the, at first, timid and confused farmers. The bond is seen when a gaggle of young farm kids follow Kikuchiyo around the village or when the farmers share their meager portions of food with the samurai. The film focuses on the group over the individual, but individuality is still important for the dynamic of the group. This unlikely bond forms a tight barricade against the raiding bandits. The classic theme of the weak helping the poor takes a twist as the farmers learn to help and defend themselves and play key roles in the final battles. Akira Kurosawa effectively portrays different groups and peoples in feudal Japan, from the farmers to the bandits who are both starving, and how they interact with each other. The similarities and differences between the groups and peoples that pushes them together and pulls them apart is also well-presented. This film has something for everyone which helps add to its allure and explains its appeal to its far-reaching audience. Romance and passion blooms between Katsushirō and Manō’s daughter Shino. Action and violence occur, especially in the final skirmish, as the farmers, bandits, and samurai, clash on the battlefield. Comedy is present, especially surrounding Kikuchiyo, who constantly makes a fool of himself and makes funny faces mocking people that the farming children love. Sadness and loss also permeate the film for war is not without its price. In short, whatever you are looking for, “Seven Samurai” is sure to have it and it will be delivered in a masterful way that only Akira Kurosawa can do. Tokyo Story is an exceedingly minimalist and personal film directed by legendary Japanese filmmaker Yasujiro Ozu. Ozu’s particular style is very different from what one would expect of a Hollywood director and his focus in this film seems to be capturing the awkward, uncomfortable feelings between family members who have drifted apart. The film centers upon an elderly couple, Shukichi(Chishu Ryu) and Tomi (Chieko Higashiyama), as they visit their adult children who have moved to Tokyo. There is little story development of significance, instead the film is more of a character piece, spending most of its time just showing the characters talk and allow their interactions to drive the film forward. Ozu wants the audience to notice every wrinkle and subtle facial movement of the characters. He manages this task by using a “tatami shot” wherein the camera is placed a low angle, mimicking the POV of a person sitting just below the characters. It also let’s him have far more control over his shot, as the camera is completely stationary for most of the film. This turns out to be a major boon for the film and the actors; by lingering on their faces Ozu allows his actors use more subtle facial expressions than would be typically be used in a film. That the actors can convey emotions without exaggeration helps highlight the understated tone of the film. 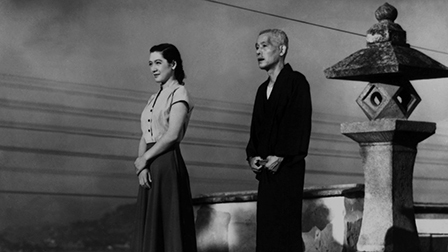 Tokyo Story is a film that rarely shows the important story beats occur, but instead focuses on the reactions of characters to these off-screen events, making the film more personal. Now Ozu’s stylistic choices would be worthless if the acting was bad, which it isn’t. Ryu and Higashiyama turn in very subdued performances, making the audience guess what they are really feeling, but their children the performances can be said to be perfunctory if a bit flat. Koichi (Sō Yamamura) and Shige (Haruko Sugimura), the eldest children, are largely one note in nature, each is too busy to care for their aging parents. Because they are so busy, the audience rarely gets the close ups shots that are the film’s biggest strength. Yamamura and Sugimura do get some chances to shine, albeit briefly, in the latter half of the film. The real standout among the supporting cast is Setsuko Hara as the widowed daughter-in-law Noriko. Hara turns in a masterful performance, and she gets plenty of chances to express complex emotions. She is smiling throughout the film, but the shots linger long enough for the audience to guess at what the smile truly means, and her facade is fascinating to watch, especially as events wear it down. The films biggest flaw is that, by and large, nothing happens. It is a film with an exceedingly small scale attempting to tell an incredibly personal story about the destruction of familial bonds. This means that film can sometimes fall prey to an overwhelming sense of malaise as the characters do ordinary things. This not an edge-of-your seat film. It is a very slow burn. If you’re looking for a fast paced film I suggest you look elsewhere. Tokyo Story absolutely shines as a slow-burn character drama, but you’ve got be ready to do some mental work to understand the characters. A great film to just sit down and analyze, but if you’re just looking for a fun way to kill a couple of hours this is not the right choice.